Dall'Abaco was born in Verona, the son of renowned guitarist Damiano dall'Abaco. His father, after seeing his son's musical talent in school, let him take on violin and cello lessons. He is thought to be Torelli's pupil from whom he would have learned violin and cello. He launched his musical career as a violinist with Tommaso Antonio Vitali in Modena, and in 1704 he joined the court of Maximilian II Emanuel, elector of Bavaria as Kammermusiker. Dall'Abaco was only a few months in Munich, when he was forced to flee with the court to Brussels, following Maximilian's defeat at the Battle of Blenheim. On Maximilian's restoration and return to Munich, in 1715, dall'Abaco was appointed Concert-meister. He continued to compose chamber music at the French and Dutch courts until 1740 when he retired. 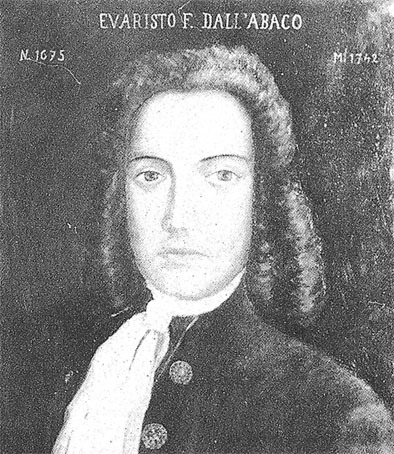 While in Brussels, dall'Abaco fathered a son named Joseph Abaco (1710–1805). Dall'Abaco's music is especially indebted to Vivaldi and Corelli. However, when he went into exile with the Munich court, he spent time in France and absorbed some of the influences there.